Surviving a disaster situation or being off-grid for an extended period of time requires preparation (thus, the term “prepper” for people who prepare). It’s not just something that you do on the fly with no forethought or training for survival. Now, some people may treat prepping as a hobby or a way of life, but what is clear is that no one who is preparing thinks of being prepared as an accidental thing that just happens without forethought. Part of being prepared is having a reliable food supply, and a garden at your home and/or your bug out location is a smart way to do that. And, while you will want to consider planning your garden around when you want to have your crops available for harvest, you will probably want to take into consideration the nutritional value of what you are growing. In other words, don’t plant just for taste (as in what you like to eat), but also plant with health in mind. Beets: Beets are an unusual root plant in that you can eat both the leaves (greens) and the roots (the beets). 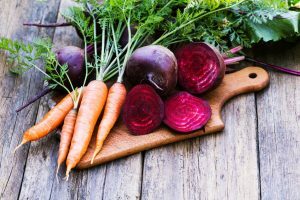 Both are incredibly nutritious, and, if you are like me and don’t care for the flavor of beets, their flavor can be easily covered with a red sauce for a tasty and healthy meal. Sweet Potatoes: Another root plant, but, unlike regular potatoes, sweet potatoes are more than just carbohydrates for your plate. And many people really like baked sweet potatoes with butter. Potatoes: Yes, regular potatoes. Tasty way to fill your stomach, and, if you don’t cover them up with a variety of unhealthy toppings, they can be nutritious, too. Carrots: This orange root plant is known for being loaded with Vitamin A which is good for your eyesight. Another nice factor is that carrots can grow much of the year unlike many plants. Parsnips: These look like white carrots, and, fortunately for people in colder climates, can often do well as a winter crop. Tomatoes: A summer food item that is easy to grow, tomatoes are worth growing because they are tasty and can be used in a wide variety of recipes. Not to mention they are high in Vitamin A and Vitamin C.
Green Peas: Another summer food that can be used in a variety of recipes which are high in Vitamin C.
Dry Beans: While black beans and pinto beans are summer crops, because they dry, they are easy to store and can, therefore, be used in recipes over much of the year. They are also high in protein. Keep in mind that this list is only a starting point for your garden, and you will likely want to grow a variety of other foods beyond these eight. But, again, these are eight plants worth considering for your garden for nutritional value and for taste, too. WHAT WONDERFUL ADVICE FOR EVERYONE! WE GET TO GROW OUR OWN VEGGIES IN OUR OWN YARD!!! Hooray for submitting this info and thank you very much!